honda integra type r dc5 - J's Garage Export Co., Ltd.
001.07 : Honda announced the release of the Honda Integra type R in Japan on July 2. The Honda Integra type R is a limited edition model aimed purely at the most serious street racers. The special color of the championship white with the red emblem comes from 1965 when HONDA won the F-1 for the first time. The Honda DC5 Integra type-R is powered by the K20A 2.0-liter DOHC i-VTEC engine and adopts a new 6-speed manual transmission. The suspension adopts a newly developed toe control link front strut suspension and reactive-link double wishbone rear suspension. The Honda Integra type R is also equipped with RECARO front bucket seats, a leather wrapped MOMO steering wheel, aluminum pedals, an aluminum shift knob, an aluminum side brake knob, exclusive aero parts, BREMBO front brakes, and aluminum 4pod calipers. The K20A type-R engine combines the high-rev intake/exhaust valve timing and lift variability of VTEC1 technology with VTC(variable timing control) to achieve a maximum power output of 220PS. Short single-passage isometric intake manifold ensures excellent intake inertia even at high engine speeds. Connecting rods and a high-rigidity crankshaft are fashioned from high-strength materials. The K20A type-R engine is approximately 10kg lighter than the B18C type-R engine. A newly developed close-ratio 6-speed manual transmission uses multiple synchronizing cones for all gears, including a triple-cone synchronizer in 1st and 2nd gears and a double-cone synchronizer in 3rd through 6th gears. An ultra-lightweight forged chrome-molybdenum steel flywheel and Torque induction-type Helical LSD are installed. 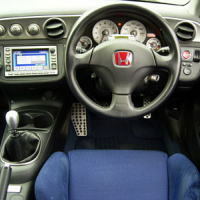 2003.09 : The Honda Integra type R is equipped with keyless entry system with answer back and colored washer nozzle.